Garbage service is mandatory per city code. All properties are required to have adequate service levels to prevent overflow of materials. The city partners with Republic Services to provide enhanced, cart-based and container-based recycling, organics (food and yard waste) and garbage collection; account management; and billing services. The comprehensive recycling and organics collection offered by Republic Services helps customers reduce the amount of garbage disposed at Cedar Hills Landfill annually. In the City of Renton, residential organics cart (gray) is collected every week while recycling cart (blue) and garbage cart (green) are collected every other week. Residential service rates are based on garbage cart size. To keep garbage service cost low and to divert waste from the landfill, residents are encouraged to reduce waste and utilize organics and recycling carts for accepted items as much as possible. 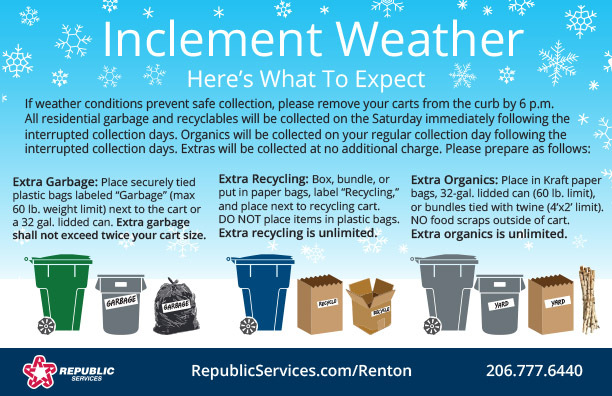 Road conditions, especially during the winter months, may impact recycling, organics and garbage collection routes in Renton. Hauler trucks are heavy and both the city and Republic Services are concerned with public safety. If weather conditions prevent collection of recycling, organics or garbage carts, remove the carts from the curb at the end of the day and follow the guidelines below. Please follow container weight limits. Recycling and garbage carts will be collected on Saturday immediately following the missed collection. Organics cart will be collected on the next regularly scheduled collection day, the following week. City of Renton single family residential customers may schedule ONE collection of extra garbage to take place on their regular garbage day between March 4 and December 28, 2019 at no additional charge. Please review the Clean Sweep brochure for instructions on scheduling your collection and a list of other resources available for fixing, donating or recycling items. Whenever possible, repair, reuse or recycle items prior to disposal to conserve resources and reduce environmental impact. All items collected through this program will be disposed in the landfill. Up to 10 units (32 gallons per unit) of garbage, each unit no longer than 3 feet on any side and not weighing more than 65 pounds. Extra garbage will be charged $4.13 per 15 gallons. Plus, two bulky items such as mattresses, sofas or chairs.